With these convenient pricing labels, your next garage sale will be easier than ever. 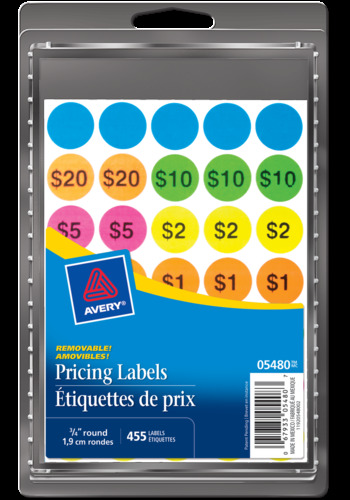 Removable preprinted garage sale labels are round labels that feature preprinted popular prices ranging from 10 cents to $20, plus additional blank labels that allow you to add your own price. With these convenient pricing labels, your next garage sale will be easier than ever. Removable preprinted garage sale labels are round labels that feature preprinted popular prices ranging from 10 cents to $20, plus additional blank labels that allow you to add your own price. Bright neon colours draw the eye so customers can quickly locate pricing information without having to ask you. Removable adhesive ensures that buyers will be able to remove price tags easily so they can fully enjoy their purchases.